Imagine waking up in a Lake Tahoe cabin in the heart of the Sierra Nevada mountains. In the winter- the scent and feel of a warm fireplace mixing with a steaming cup of coffee or hot chocolate. In the summer- the pecking of the Hairy woodpecker and smell of Ponderosa Pine and clean mountain air wafting through the windows. This scenario is a reality. 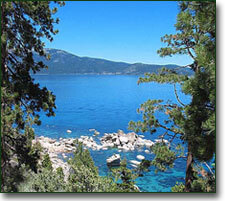 Thousands of cabins dot the varied landscapes around Lake Tahoe. You can rent in the quiet, isolated mountain wilderness or feet away from the shores of the blue expanse that is Lake Tahoe. Though the area around Lake Tahoe offers a wide variety of accommodations from camping to luxurious hotels, a cabin provides the perfect blend of privacy and services. On the sandy shores of the lake or near a world class ski resort, lie traditional Lake Tahoe cabins from the 1930's that have the cozy charm of years gone by with stone fireplaces and knotty pine interiors. 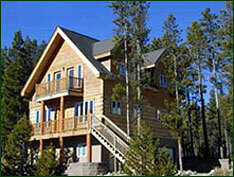 Or you can stay in a modern cabin with all of the modern amenities like Internet access if you need to be connected. There are cabins for everyone. Some offer the simple amenities and the peace and quiet of the wilderness, while others are closer to the action and offer a Jacuzzi and pool. Cabins are perfect for large families or groups of families who want to travel and live together, away from the hustle and bustle of downtown and closer to the fishing, biking, hiking and skiing. 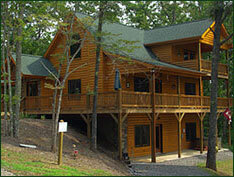 Most cabins come with fully equipped kitchens, barbecue areas and fireplaces; some sleep up to 15 people. You can rent a cabin from the numerous vacation rental companies around Lake Tahoe or stay in cabin compounds found on many resorts, campsites and B&B's.